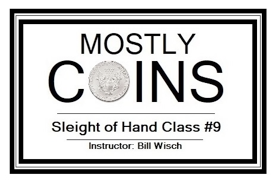 v This 8 week class will include some original coin sleights, as well as some extremely effective, standard sleights, effects and routines, taught in full. You will surely enjoy performing this coin magic for your entire life! v There will also be a surprise, non-coin item (or two), covered as well. v Every student will receive a “Class Notes/Extras Folder”. v Students will also have an opportunity, if they choose, to select a personal coin trick or routine that they already perform, or would just like to learn, improve, dissect or work on. As proven in past classes, many valuable and unexpected ideas, thoughts, tips, etc. come from this type of bonus activity. v If you want to have a fun time learning some wonderful, sleight of hand, magic, reserve your spot ASAP. You will not be disappointed! CALL 973-769-2893 to reserve a spot or for more information. See you on Tuesday, March 19th!